Life changes when you read! My Book – Is There More? Featured: Did you know I wrote a book? Guess What? I wrote a book! I have always loved short stories and stories that make you think. My brain tends to run away with a range of possibilities when it comes to certain situations. I have always been the person to imagine a “What if?” scenario. I love to explore different ways of thinking about things that you see everyday. In my book Is There More? I wrote 8 short stories that explore the world around you in a new and different way. If you are curious about the inspiration behind the stories, you can read about them here. Is There More? is available on Amazon in print as well as e-book. If you are looking for something new and different to read, why not give it a try? If you like it a review is always appreciated! What Makes a Great Christmas Gift? My Book! Do you have a book-lover on your Christmas list? Looking to give someone a fun and interesting book that will make them rethink the world around them? Want a book that makes you look at the world a bit differently? Like stories similar to Twilight Zone and Black Mirror? Then you my book, Is There More? ,is the perfect Christmas gift. It is a book of 8 short stories that all explore the world from a different angle. My book is a quick and interesting read. Is There More? is available as a paperback and an e-book as well. Be sure to check it out on Amazon! And if you enjoy it or those you share it with enjoy it a review is always appreciated! Thank you and have a great holiday and a Happy New Year! For me the world is a vast place. We can’t know everything and we never will. What helps me make sense of this world is the idea that if you look at something from a new angle you can see how to change things. Many times we get stuck looking at the world one way, we think that is the only way things can work. But some of the most important inventions and changes in society happened because people decided to go beyond the edges of what they saw. They decided to flip things on their head and see what happened. I firmly believe if we did this more we could solve a number of problems in our lives. Is There More? is eight short stories where you are placed into situations that turn things on their head. Enter a world where you can reset someone like a computer, or somewhere where you can hold your own heart in your hands. My stories are designed to make you look at something ordinary and wonder what else it could do, what else could happen if you took the time to reconsider the way things work. It is a quick read that will hopefully make you wonder if there is more to this world than you first thought. Help me celebrate my book’s birthday by giving it a read. It is on Amazon the e-book is $2.99 and the paperback is $6.99. If you enjoy it please consider leaving a review. Thank you! Is There More? An Exciting Book of Short Stories! Need something to read this weekend? Something different, exciting and quick? Want a book that will make you rethink the world around you? Then my book of short stories, Is There More? is for you! Is There More? is a book of 8 short stories. Each story sets you in a world you think you know but once you dive into the tale you realize things are not as they seem. Things feel and look different. The characters and plot make you rethink what you know about everyday things around you. A set of books that seems like a pile of pages becomes a group of souls that are calling out for you to read them. If you ignore them what will they do? A simple letter becomes a way to connect through the ages. The idea of resetting a computer takes on a whole new meaning when it is a person you are resetting. These are just some of the topics and ideas you will get to explore in my book. Is There More? is available in paperback for $6.99 and in e-book for $2.99 on Amazon. Pick it up and explore a new world. If you enjoy it be sure to leave a review either on Goodreads or on Amazon! What should you read next? How about my book, Is There More? Have you ever asked yourself what would happen if the books around you could speak? Or what would it be like if you could reset someone like a computer? Or even how life would be if you could make friends with your inner demons? These are just some of the questions I asked myself when I was writing my book Is There More?. I started with some What If? questions and explored where the ideas could go. I have always loved asking that question and running with the ideas. I wanted to get readers thinking about the world around us and how different things could be if we just ask What If?. If you are looking for a book that will give you some interesting ideas to explore or will ask some questions you haven’t thought too much about then look no further than my book Is There More? . It is a short story collections of 8 stories that explores the world around us in a twisted, different way. If you enjoy Twilight Zone or Black Mirror you will enjoy these stories. I wrote them hoping that readers would be able to question the world around them and look at it with new eyes. I have recently dropped the price on both the e-book and the paperback. The e-book is now $2.99 and the paperback is $6.99. If you are looking for something to read this weekend or during the coming week, it is a great quick read! Be sure to get it on Amazon! The world around us is more vast than we may believe. Look deeper. Push past the veil of reality to find out what truly lies beneath. What you will find looks a lot like the world you see everyday, but a closer look shows you how much more there is to see. It is a world where the books on your shelves have voices, and they are not happy. A world where a person can be reset as easily as a computer. Somewhere you can open your door to find a “Choose Your own Adventure,” book waiting to take complete control of your world. It is a place where you may believe you know what is possible, but looking deeper shows you just how many possibilities truly exist. Turn each page and always ask yourself, is there more? Also be sure to add it to your Goodreads shelf! Did you know I wrote a book? Looking for something different to read? Something that may remind you of The Twilight Zone? Something that makes you think about the world a little bit differently? Then you will enjoy my self-published,short story collection, Is There More? It is an easy and quick read but one that is exciting and will hopefully make you think. And if as one reviewer stated you found it to be a, “… real eye-opener and conversation-starter,” then please leave a review. Need Something to Read This Weekend? Looking for a quick, fun and interesting read this weekend? Why not check out my book Is There More? A short story collection with eight stories that will make you re-think the world around you. Stories that give you a different way to look at love, the books on your shelves, dating apps and more. Summary: The world around us is more vast than we may believe. Look deeper. Push past the veil of reality to find out what truly lies beneath. What you will find looks a lot like the world you see everyday, but a closer look shows you how much more there is to see. It is a world where the books on your shelves have voices, and they are not happy. A world where a person can be reset as easily as a computer. Somewhere you can open your door to find a “Choose Your own Adventure,” book waiting to take complete control of your world. It is a place where you may believe you know what is possible, but looking deeper shows you just how many possibilities truly exist. Turn each page and always ask yourself, is there more? Available through Amazon in paperback as well as e-book. Check it out! P.S. And if you enjoy it a review would be much appreciated! Author Interviews- Learn a Bit More About Me! Been wondering where I get my ideas to write? Or why I write in the first place? Want to learn a little more about me? Check out the two author interviews I did recently! And while you are there be sure to check out the other interviews with the other authors that are featured! Be sure to check them both out to learn little more about me! 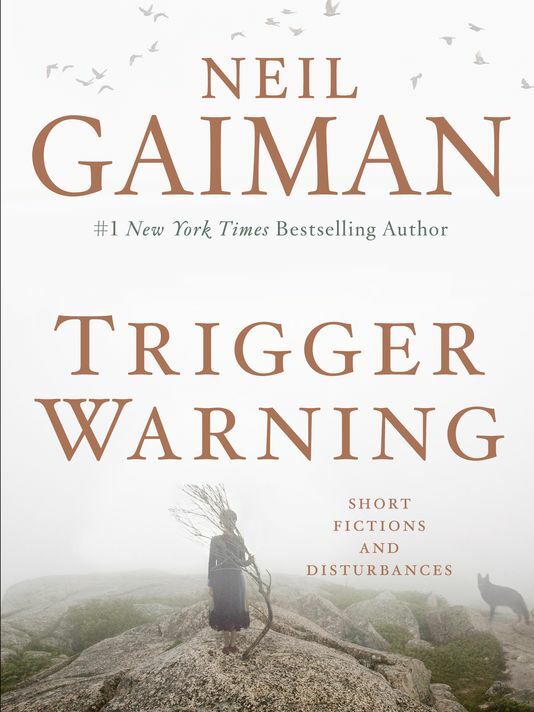 Neil Gaiman’s latest short story collection is titled, “Trigger Warning.” In the introduction he explains why he decided on this title. He starts the introduction by saying, “There are things that upset us. That’s not quite what we’re talking about here, though. I’m thinking rather about those images or words or idea that drop like trapdoors beneath us, throwing us out of our safe, sane world into a place much more dark and less welcoming.” (Gaiman, xi). He goes on to talk about the idea of a trigger warning and the fact in some way or another we all have things that trigger us in some manner. Some are more sever then others but some smell, sound, image or word is going to bring up the past for us and is going to remind us of a moment in our lives. Sometimes they are good and sometimes they are bad. I enjoy Neil Gaiman’s stories because they explore the darker side of life. He states that he wonders that if in the future his books would be given some type of warning labels. His work can be dark and twisted and for some people I can see why they can be disturbing. He states he titled this set of stories “Trigger Warning,” in order to beat people to the punch. Yes, some of Neil Gaiman’s stories are hard to read and can make you squirm. Some of them are hard to understand and figure out what they are trying to tell you but in the end they are not only about the darker side of life. There is always some type of light to counteract the darkness as well. Just as there is in life. Neil Gaiman’s stories give the reader a different way of looking at the world around them. He gives people the ability to safely explore the darker side of themselves or the world. He also creates stories where certain things seem like they may actually happen to us. This can be unsettling but also puts the reader on guard. Not everyone is going to warn you of certain disturbing aspects like Gaiman does here. One of my favorite stories in this collection was “The Thing About Cassandra.” There is a young man who creates a fake girlfriend when he is young in order to fit in better. Years later people start telling him that they have seen this girl, that she is real. The man is confused and feeling like he is losing his mind for a time. He made her up yet people have seen her and she is upholding the story he created. He meets her still wondering what could be happening. The whole time the reader is wondering if this is just some freaky coincidence or if he somehow created her by creating such a detailed story about her life. In the end the reader is left wondering who is real, who is not and if it matters. As with his other collection Gaiman provides an explanation for each of his stories and poems origins. He gives us a glimpse into where he gets his inspiration. These explanations may help to tone down the darker sides of some of the stories. The reader gets to learn that many of these stories didn’t come from a dark and twisted place. They grew out of curiosities and questions or simple prompts. I like these explanations. As a writer myself it is always interesting to me to see where people get ideas for stories. It can also show that just because a writer writes a bit darker stories or some things that make you uncomfortable does not mean they themselves are dark or intimidating. These explanations can help put a line between who the writer is as a living breathing person and his writings and imagination. 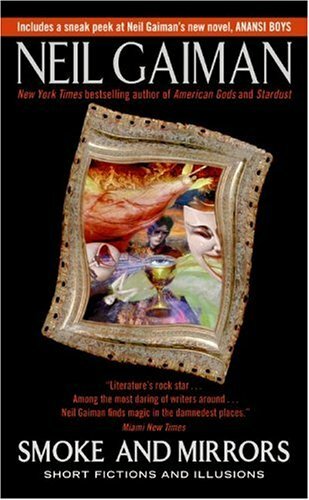 If you have read any of Gaiman’s other story collection and enjoyed at least one of the stories I highly recommend this collection as well. Yes, some of them are weird, odd or hard to comprehend. Some leave you hanging with no answers, forcing you to come up with conclusions yourself. But they are a fun adventure to go on and they may help you see the world around you just a bit differently. Neil Gaiman has a somewhat dark and twisted way of looking at the world. He doesn’t write stories where it is easy to pick out the lesson or main idea. He doesn’t write stories where every reader is going to take the same thing away. This is one of the reasons I like his stories so much. He lets the reader interpret the story and decide what the characters decisions could ultimately mean. His collection of short stories “Smoke and Mirrors,” highlights this idea well. As the title states the theme that runs through these stories is that reality can be and often is warped around us. What you see is not always what you get. The most obvious explanation is not generally the truth. His stories make you think twice about what you are reading. You begin to second guess everything you read and every character you meet. You wonder what their true motivation may be and if they are hiding something from the reader. His stories make you look deeper then the surface. One of my favorite stories was “Murder Mysteries.” The story begins innocently enough with a man stuck in Los Angles when storms in England prevent him from flying home. There is little indication that anything bizarre is going to occur. But, as in many of Gaiman’s stories, there is this, “hold your breath,” waiting period. You are waiting for the moment when what you think is happening is going to be twisted around to reveal something out of the ordinary. The man takes a late night walk and ends up sharing a cigarette with a stranger. In payment for the cigarette the stranger offers to tell the man a story. He tells him a tale of angels, a murder and the set up of the pieces that will create the present day universe. It is a story that holds the protagonist captive as well as the reader. We want to know who killed the angel and why. We are astounded to find out how the whole thing was a set-up to place the pieces for Lucifer’s fall. The end is the point where the reader is left to make an interpretation of their own. It ends with the man on a plane on his way home. He reads about a grisly triple murder, one that sounds like it involves the people he was with before he met the stranger. You are left wondering who the stranger was. Was he the angel from the story? Was he crazy? Did he do something to our main character in order to continue his job as a vengeance bringer? Or did he let him off the hook for any crime he may have committed? Gaiman doesn’t state out right what he wants the reader to take away from the story. You are left intrigued and curious. It is up to you to look beyond the smoke and decide what the story was meant to tell you. Gaiman allows his readers to instill a part of themselves in the tale and take away what they deem is important. The other story I really liked was, “We Can Get That for You Wholesale.” It is yet another story that appears to start out innocent. A man finds out his girlfriend is cheating on him. He goes looking for a way to punish her and decides to see if he can find an assassin to do the job. He ends up finding a company via the yellow pages. One of the best parts of Gaiman’s writing is the way he puts these seemingly outlandish pieces into his story. We should be surprised and questioning why someone would advertise being an assassin in the yellow pages. But our protagonist passes it off and accepts it easily and in turn we do the same. He doesn’t wonder about it over and over. He doesn’t question it. He accepts it and moves and so must we as readers. What is great about this story is the way it escalates. At first the man just wants his ex-girlfriend and the man she cheated with dead. But the man he meets with from the company keeps offering him a better deal. If he has more and more people taken out it gets cheaper and cheaper for the man. It is a bit of dark humor. We kind of laugh as the man starts making lists of people he hates. He forces reasons why he wouldn’t mind that they die; just so he can take advantage of the deal. The reason this works so well is because we all can relate to the idea, granted on a much lesser scale. We all have heard of a deal and thought, “Well I can’t pass that up!” You are shopping online and if you add just one more item you get free shipping. Though many times that item is actually more expensive then the shipping itself would have been. We all are guilty of hearing a deal and wanting to make sure we don’t walk away from a fantastic bargain. No one wants to be that person who “lost,” money. The idea here is to always look beyond the surface. The man doesn’t realize what he is doing. In the end he is the reason it would appear that this company is now going to take out the world. He allowed this to happen because he didn’t stop and try to see what was beyond the smoke screen of the fancy words and bargains. I loved this story because it was fun to read and it left you wondering at the end. It left you wondering if he had just questioned the whole thing once what could have happened. This collection not only had short stories but some poems as well. There is a type of writing for everyone inside these pages. Gaiman also provided an explanation for where the inspiration for each story came from. I enjoyed this as well, it is always nice to see where some of these ideas spring from. As a reader I got immersed in each story. I read them wondering what may be beyond what I initially perceived and that made the stories fun and intriguing to read. Why I think the Dursleys are afraid of magic.